The continuous arrests, detention, torture and disappearance of people in Oromia should indeed be a cause for concern to every Oromo people living in the country and abroad. The past 22 years have been the most painful period in Oromia. A week hardly passes without someone being picked up and detained by the TPLF security agents for one unexplained reason or another. The Last couple of weeks I have received a lot of messages from Oromo nationalists residing in western parts of Oromia through my emails, which I preferred not to mention their names here because of their security. Here is the message I received from one friend in “Afaan Oromo” and I wanted to put it in English as follows; “I am in deep tensions and annoyed because of the case associated with my family. My father was a respected businessman in our local area. Now about two weeks are passed since my father left his home and his whereabouts still unknown. Following his disappearance the TPLF Trojan horse better known as OPDO imprisoned one of my family members and coercing to reveal where my father is. What I knows about my father is, after he openly started criticizing the evil doings of the TPLF led Ethiopian regime and the Puppet OPDOs on different public meetings; he was continually harassed and even received several death threats including the family. He was arrested at different times suspected of OLF member without due legal process and without family visitations, tortured and interrogated at gunpoint to reveal the agents he was working with for OLF. The reason why he was mainly targeted as criminal and went to jail at different times is not because he was a criminal or have done anything wrong against anybody, but only because he protested that why his Oromo brothers and sisters were cold-bloodedly killed by TPLF securities without any reasons and because he protested against the widespread injustices being committed by the regime agents in Oromia. When my father was in woyanes secret detention center, the inhuman treatments he experienced at the hand of the torturers were horrible and even some part of his face was disfigured because of the massive tortures”. Indeed this is a daily practice of the regime against many Oromo in wider scale. I personally know many Oromo; outstanding students, teachers, business men who were unlawfully detained by woyane securities or disappeared and their families are not informed of their whereabouts. The most worrisome situation still going in various parts of western Oromia is that, people always branded as criminals and unlawfully detained only for being an Oromo and alleged association with the OLF or sympathizing with Oromo opposition political organizations. Despite a lack of any evidence against those people, the security agents continuously torture them in secret detention centers. Also other friends from the same area said that, to pick up peoples at night and take to prison is still a daily practice of woyane securities. Imagine sitting with your family waiting to have the dinner only to receive a knock on your door that you are wanted for questioning. You are then whisked away from your beloved family without anyone knowing your whereabouts, condition of detention or what crime you might have committed. This is exactly what peoples in many parts of Oromia still going through. Many people disappeared or been killed in a very systematic way simply because they exercised their fundamental rights. Diverting the mobile phone to their security forces and internet censorships are being practical on many people. The current human rights situation in western Oromia is terrible and repugnant. There is woyanes rule that does not tolerate any form of criticism in the area at all. Even the very slightest criticism of the government in the area could land a person in jail and charge with terrorism or “shororkeessumma”(in puppet OPDOs definition). Now this situation is highly forcing people to live under great fear and uncertainties than ever. It has become normal for the people in western Oromia to simply disappear into thin air; especially those who dare to criticize the government or who are reported by their adversaries to the regime securities. It is very annoying when the TPLF minority led regime blatantly continues through its security forces to unlawfully arrest and detain anybody they perceive as an opponent. To add insult to injury, Most of the detainees are seldom informed of their rights and/or reason for their arrest or detention and are often held beyond the time limit without charge contrary to the edicts of the so called constitution. Several productive youths are running away to escape the difficult life that controlled the area. Activism for democracy, human rights and justice are being met with secret killings, torture, arbitrary arrests and detention. The name TPLF security or “Dehninet” has brought a great fear to every Oromo hearth, whenever someone is picked up. Some remain silence because they are afraid to speak up against what is going on. We have seen that On the beginning of this year January 2014, when people on the world joyfully celebrated the New Year and wished peace, security improvements and prosperity to their own people, in contrary the Ethiopian Federal Court gave a prison sentence to 45 people, Most of them are Oromo nationalist political prisoners sentenced to three to twelve years in prison. Without committing any crime against anybody, they were unlawfully arrested in 2010 and were accused of being members or sympathizers of the Oromo Liberation Front (OLF). This alone can publically tell that TPLF/EPRDF regime has totally cracked down on political freedoms and continued committing widespread human rights violations with total impunity. Ethiopia today is ;the only country where the government publically labeled genuine dissents as terrorists and criminals, the worst kept secret killing field and the most politically intolerant regime in Africa. It is the country where the rule of law, good governance and the sanctity of human life are alien concepts. It is the country where torture, enforced disappearances, extra-judicial executions, detention without trial, statutory murder and extra-judicial convictions has become officially rooted as normal governance practices and intensifies its containment of democracy each day, and rules strictly through the instrument of paralyzing fear and the practice of brutality against ordinary citizens. We have seen that when told the reality of Oromo, they call it anti-national or terrorism. For long we have seen that the TPLF owned Media distort the truth of Oromo for their own cause. For long we have seen that their Media created false and fabricated stories on Oromo nationalists. For long we have seen that several Oromo nationalists who were unlawfully detained And languishing in prison have been denied justice by TPLF court judges who were hired by a regime whose sole aim is to brutalize, torture and silence anybody against their tyrannical style of governance. For long we have seen that many innocent people unjustly sentenced to life term and death. The TPLF minorities are all the leaders of the executive the legislative, judiciary and military branch, their words are final and anyone who goes against their authority is doomed. They are all the lawmen’s, the judges, the jury and the executives. They act as the ‘Creators’ of the people in Ethiopia, They decides who walks freely or shackled in jail, live, work and/or die. Judges are hired and fired by the TPLF cadres without any explanation. They owe their entire livelihoods to them and they determine who comes before these judges and the sentences they receive. Now, getting justice for Oromo in Ethiopia under TPLF is compared to hunting for a dinosaur in this day and age. It is very dangerous for the people when a single party members from one minority group has all such powers and even more dangerous if there is no accountability and no limit. No single party or leaders should have absolute power to run a nations single handily and with iron fist. What is the future for Oromo? Will there be any conductive environment where all Oromo people will be free from such kinds of fear, intimidation, torture, arrest and humiliation to express their legitimate rights and fundamental human rights which remains Unthinkable under TPLF gangs? No family, groups and businesses should count themselves safe from persecution, arrest, humiliation, detention without trial and torture under this brutal regime. We Oromo should be brave enough to come out from every corner and fight against the ever worsening injustices that continue to bedevil our motherland. Everyone, irrespective of party or group, is duty bound to act. In our journey to Demand our freedom, we must be ready to use every Avenue. The injustices meted on us are enough. We should not expect the westerners to bring about the change we are seeking for in our Land, it’s we” Oromians ” who has to come together under one umbrella with a sole purpose of eradicating Dictators and liberating our people. We might not be united in the same political party but we should be united in the same course in fighting dictatorship. Look at the likes of Tunisia, Libya and Egypt. It’s the voices of the people that brought about change from the streets of Tunis to Tripoli to Benghazi and from the Cairo to Alexandria. It has come to a point in which we also need to do anything to get our freedom. For any meaningful political change to take place, the people must take it upon themselves to effect the change. As a result, we must not expect that an angel will descend from heaven and liberate us from Dictators. 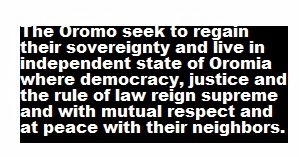 But the onus of liberating Oromia from oppression is every Oromians obligation. Fellow Oromians, Let us ask ourselves these simple questions. With logic, we understand how our people are dying in silence. Why TPLF led Ethiopian regime mainly targets Oromo people; intellectuals, Businessmen, teachers, university students, artists and entrepreneurs? Why many Oromo on a daily basis are being arrested and detained without genuine reasons? Why many Oromo are missing and their whereabouts remain unknown by their family and love ones? Why many Oromo are still languishing in jail without trial or have had their trials delayed? Why many Oromo Nationalists were shot dead in their home and in public by TPLF securities? Why many people have been fired from their jobs and schools for no apparent reasons? Why many lands and properties have seized and looted from Oromo under this regime? Why many Oromo on daily basis are fleeing TPLF/EPRDF persecution and suffering in neighboring countries and dying in deserts? How on earth one can be sentenced to life term or death penalty only for demanding his Freedom without committing any crime against anybody? Tsunamis of Human right violations of the above are well documented and are available online. Do we as a people only have to speak the truth and or condemn injustice only when it affects us directly and or personally? This is a question that I am posing to some people who are in a position of this regime today. To those dummy OPDO leaders who continue to carry out TPLFs dirty works be warn that you will all be going down with them. The world is now a global village and war crimes and crimes against humanity committed by any person or party will never go free. The choice is yours. To those who think they have no say or voice on the atrocities committed against our people, Martin Luther King Jr. In the end, we will not remember the words of our enemies, but the silence of our friends. Oromia is under silenced bleeding by this evil regime. If we see injustice and remain silent, we have sided with evil. We have seen that Killing Oromo is the trade mark of this regime. These killings are not spontaneous or accidental they are done intentionally to silence the whole people. Therefore, to prevent further injustice and sufferings there needs to be a collective response to the giant atrocities in Oromia. We all have a duty to ensure that we free our land from TPLF/EPRDF dictatorship. This should be done with united front and sincere commitments. I hope the sooner we all look at freedom as an inherent human right that is a prerequisite for any society to progress, and not as a “gift” to be given to only to the deserving, the sooner we will face this challenge as one nation UNITED in the destruction on tyranny! Oppression cannot stand forever, and it shall be replaced with freedom. So, Fellow Oromians at home and Diaspora, Let us all rise up in unison and demonstrate against this brutal regime and fight for our freedom and for the freedom of all political prisoners who are inhumanly suffering in Ethiopia. 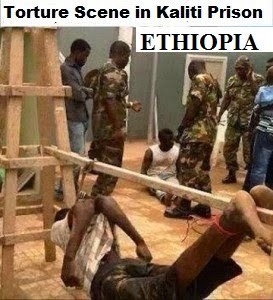 Ø Nearly 90% of political prisoners in Ethiopia are Oromo nationals. Ø In a survey of more than 500 Oromo refugees in Minnesota, 69% of men and 37% of women had been tortured by Ethiopian government. This number is considerably more than the 5-35% for other refugee populations. Ø The Oromo language is spoken by majority population in the Ethiopian empire; yet, the empire’s official language is that of the minority Amhara. Ø Oromia accounts for 65% of the empire’s GDP and 60% of its foreign exchange earnings; Yet Oromia is the least developed region in the empire. Ø Nearly 100% of Ethiopia’s hydro-electric power generation originates in Oromia; yet less than 13% of Oromia’s population has access to electrical power. Ø Ethiopia today is an authoritarian regime with no room for independent political mobilization or debate and where political space for electoral competition, the free exchange of ideas, and independent civil society organizations is virtually nonexistent. Ø Ethiopia receives US$3.5 billion (on average) annually in development aid which it utilizes as a tool to suppress political dissent and to consolidate the power of the ruling Ethiopian People’s Revolutionary Democratic Front (EPRDF).The European Union, the United States, the United Kingdom, and Germany are the largest bilateral donors.